Tens of thousands faced off against the police on November 14, braving high-pressure water cannons and tear gas. Undeterred, they marched again on December 5, donning facemasks in defiance of the president’s threats to ban rallies with masks. A 69-year-old farmer remains in critical condition after being doused at short range by a water cannon. Police have arrested nine members and officials of the Public Service and Transportation Workers union over the past two weeks, and imprisoned five officials of the Construction Workers union. 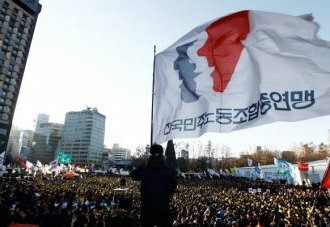 In the lead-up to the December 5 demonstration, they raided 12 offices of eight Korean Confederation of Trade Unions (KCTU) unions and affiliates, copying files and confiscating documents and computer hard drives. But there’s a growing resistance—led by organized labor. The KCTU is anchoring a coalition of workers, farmers, the urban poor, and students to oppose Park’s pro-corporate agenda and neo-authoritarian rule. The movement for democracy against the military dictatorship during the 1970s and 1980s produced a strong, militant labor movement, based in large industrial unions. At the movement’s height in 1996, 3 million workers shut down auto and ship production and disrupted hospitals, subways, and television broadcast for four weeks to oppose new labor laws. That all changed after the Asian financial crisis in 1997. Foreign investors bought up shares in South Korean companies at bargain prices. The International Monetary Fund (IMF) bailed out the country’s economy—but at a steep price. It introduced two laws that devastated worker standards. One legalized layoffs for the first time. The other legalized the use of dispatch workers through employment agencies and popularized in-house subcontracting. Almost overnight, workers with decent, well-paying, secure jobs became “precarious workers”—part-timers or temps without benefits or job security. Today, among Organization for Economic Cooperation and Development (OECD) countries, South Korea ranks number one for the most precarious workforce. Why are South Korean workers so upset, and why is their government responding with such force ? Park and her ruling New Frontier party want to introduce a package of laws that would fundamentally change the country’s labor market and undermine the power of unions. They would let employers fire workers arbitrarily, increase the use of temporary labor, and extend the contract term for temporary workers from the current two years to four. The recent protests against her government are part of a coalition effort. Fifty-two organizations representing various sectors of society came together earlier this year to establish a national coordinating body, with regional chapters across the country. They’re united not only against the labor law changes, but also the rest of Park’s pro-corporate agenda and anti-democratic initiatives. KCTU, the coalition’s anchor, is the second-largest labor federation in South Korea and by far the most militant. Its 1,200 affiliated enterprise-level trade unions and 626,000 members account for 40 percent of the country’s union members. The larger and historically more pro-government Federation of Korean Trade Unions (FKTU) had pledged earlier this year to not participate in the tripartite negotiations with the government and business representatives over the labor-law changes. But its leadership did an about-face in the fall and entered the talks, giving legitimacy to the government’s push. Rank-and-file members of FKTU, especially in the financial, metal, and public sectors, strongly oppose their leadership’s compromise with the government. Han—who boycotted the tripartite committee, considered by many a rubber-stamping process—is no stranger to struggle. In 2009, as head of the SsangYong Motor branch of the Korean Metal Workers Union, he led 900 workers in a 77-day occupation of a SsangYong Motor plant to protest mass layoffs (their slogan : “Layoffs equal murder”), which earned him a three-year jail sentence. The proposed labor-law changes would dramatically increase the power of South Korean employers. Unions say employers will use this new loophole to replace regular workers with contract workers, who aren’t entitled to the four major types of insurance that employers must legally provide—health insurance, unemployment insurance, industrial-accident compensation, and social security. Another proposed law would replace the country’s seniority-based salary system with a performance-based system, and let employers terminate workers for “low performance.” Currently, “low performance” cannot legally be used as grounds for firing—though employers resort to harassment and humiliation to push employees to leave voluntarily. The new law would also allow employers to change their employment regulations—which govern the method of paying wages, the amount of annual paid leave, and so on—as they please, without worker consent. Employers of 10 or more workers are required to submit these rules of employment to the Ministry of Labor, and post them where workers can see them. Right now a company can alter its regulations only with the explicit consent of the union—or, if there is no union, the majority of its workers. “This [reform] is designed to eliminate all means of resistance by organized labor, and this is precisely the aim of the Park Geun-hye government,” Han said. The government is also introducing a peak-wage system, where wages would automatically be cut when a worker reaches age 55. It reasons that workers become less productive as they age—and with the money they save, companies can hire more young people and solve the country’s growing youth unemployment. This feigned concern for young people masks the real beneficiaries : companies that stand to reap enormous profits from cutting older workers’ wages and increasing their reliance on temporary labor. 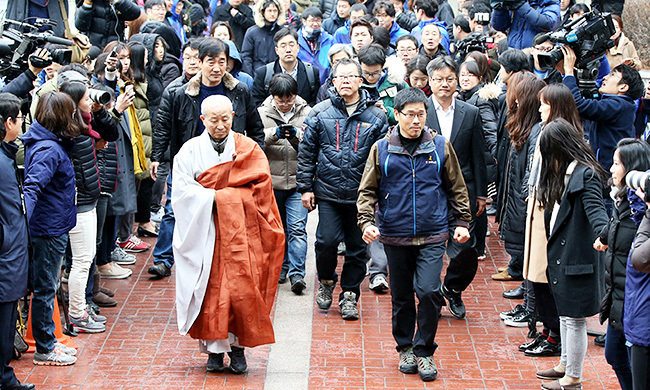 UPDATE, December 10 : Korean Confederation of Trade Unions President Han Sang-gyun turned himself in, after 2,000 police surrounded and threatened to raid the Buddhist temple where he had been taking sanctuary since November 14. Read his statement to the press here. The KCTU has called a general strike against the Park government on December 16. Writed by Hyun Lee and Gregory Elich are both members of U.S.-Korea Solidarity Committee for Democracy and Peace. Elich is also the coauthor of Killing Democracy : CIA and Pentagon Operations in the Post-Soviet Period.